Cave diving is my true passion in life. I have been actively cave diving since 1997 and exploring caves since 1999. The reason I love to teach cave diving is because the caves have given me so much in my life I feel I should give something back. I do that by teaching cave diving with a great emphasis on safety, but an equal importance to the conservation of what I think are one of the most special places on earth. My goal in teaching is not only to certify my students, but to give them a bit of the love and respect that I have for this environment. I do that by trying to create a cavern or cave diver that is more interested in making themselves a better diver to truly be able to enjoy their surroundings safely with no impact. So, I try and only teach people who love what they are experiencing. These courses can be taken individually or as combined courses depending on individual experience and skill level. avern diver course is designed to teach the very basics of overhead environment to a diver who would like to stay within the recreational zone, also using basic diving equipment with several modifications. To enroll into this course you need to be an advanced open water diver with good buoyancy control. They would need 25 logged dives or more and be at least 18 years of age. in the classroom you will get some information about various different types of caves to give you an insight into the diverse cave environments around the world. after that we adapt what equipment you have to use in the cavern environment. this will be done by making your equipment as simple as possible and then adding things like longer second stage hoses, lights, reels and a few other necessary things to give you the tools you need for safe diving in environments where just going up is simply not an option. on land we will practice the use of reel and the basics of guide lines. also, we will practice team communication and emergency procedures. in open water we practice different fining techniques, use of reels and once again emergency procedures. at the same time you will be improving buoyancy and body position. all of the skills in this course will improve your all around diving skills. ntro to cave course will be one of yours most challenging courses. It will take you beyond the recreational boundaries into an environment which is both incredibility beautiful and (if done incorrectly) very dangerous. 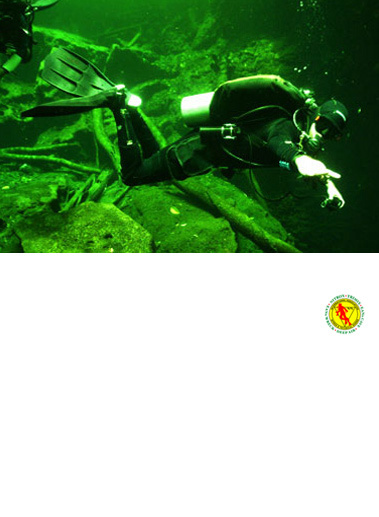 To enroll into this course you need to have cavern and essentials certification with good buoyancy and body position. they will need to have 50 logged dives or more and be at least 18 years of age to start this course. you begin in the classroom with lectures on environment, dive technique, stress management, and communication in darkness. as this course is taught with banded and manifold dual tanks we have an equipment workshop to make sure your equipment is working and appropriate for the cave environment. it is always better for you to do any technical or overhead environment course in your own equipment however, we have equipment for you to use if needed. on land you will learn proper techniques for entering and exiting the cave environment. this will be done with and without visibility and considering virtually all problems that could arise. in open water you will be introduced to new skills that will change the way you look at diving in general. you will not just need to be able to do the skills, but do them well and with good buoyancy and body position at all times. all very challenging. You will then do at least 8 cave dives. During these dives your limits will be pushed in general dive skill, emergency procedures, stress management and problem solving. In the end you will come out a much better diver both in caves and in the open water. 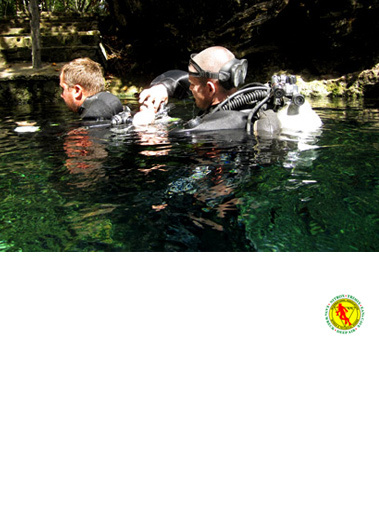 ull cave is one of the most challenging courses in the dive industry. This certification is one of the highest in the diving world. To enroll into this course you need to be at least 18 years of age. minimal certification for this course is basic/intro to cave certification and a minimum of 120 logged dives with mastery of buoyancy and body position. The skills in this course are not any more demanding than the basic/intro, but you are required do everything to a much higher standard. It will definitely improve your skill level beyond what you can imagine. In the classroom you will learn how to improve your stress management skills. You will also learn how to plan decompression procedures and more precise gas management techniques. 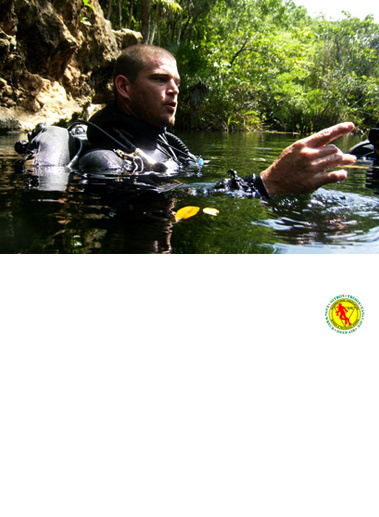 there will be several sessions of land drill, teaching you the concepts of complex navigation in cave diving. these will include t’s and y’s, jumps and gaps, circuits and traverses and safety procedures for each of them. you will also practice the use of separate cylinders for decompression gas. In open water we refine your diving skills. In at least 8 cave dives we will be practicing complex navigation, more precise team communication, protocol for restrictions (smaller passages), decompression procedures, and higher stress management as well as many more skills that will prepare you for one of the most challenging environments you can encounter on earth. Tulum Scuba has been created by Jeff. We teach scuba diving from entry level open water diver course, to the most advanced full cave diver certification.